Perhaps you will find a former veteran CIA station chief in Islamabad, Pakistan, Robert L. Grenier more credible. Writing in his just released book: 88 Days to Kandahar: A CIA Diary (Simon & Schuster), he sums up U.S. government policy this way: “Our current abandonment of Afghanistan is the product of a…colossal overreach, from 2005 onwards.” He writes, “in the process we overwhelmed a primitive country, with a largely illiterate population, a tiny agrarian economy, a tribal social structure and nascent national institutions. We triggered massive corruption through our profligacy; convinced a substantial number of Afghans that we were, in fact, occupiers and facilitated the resurgence of the Taliban” (Alissa J. Rubin, Robert L. Grenier’s ‘88 Days to Kandahar,’New York Times, February 15, 2015). This entry was posted in Crime and Justice, Politics and Government, Privacy and Surveillance and tagged Al-Shabab, Anti-terrorism bill, Ralph Nader, Stephen Harper, West Edmonton Mall. Bookmark the permalink. Harper will dismiss this and move on. The man is in love with his own beliefs which of course along with the market ideology came directly from God. Interestingly enough the new poll clearly show how easy it would be to get rid of these maniacs. He has the support of 35%. The Liberals 34% and the NDP 21% – this means that the Progressive voice in Canada is a strong 55% but in the First Past the Post that means NOTHING and they will govern us all with a majority because Justin Trudeau and Thomas Mulcair cannot talk to each other. And then we wonder how nations fail. Carlos, the problem is Harper’s at 35% and Trudeau’s at 34%. Trudeau won’t cooperate when victory is so close he can taste it. Back to the anti-terrorism bill, I was very disappointed with the way the Liberal handled this. They won’t oppose it but say it’s so flawed they’ll amend it when they form government. If you need to fix it, then why are you supporting it? Answer: the polls show over 80% of Canadians support it (even though they likely don’t even know what’s in it). At least the NDP had the decency to say they opposed it before they said they’d amend it after they became government. Patriot has been a word that has been used, deployed and tossed aroiund with wreckless abandon. 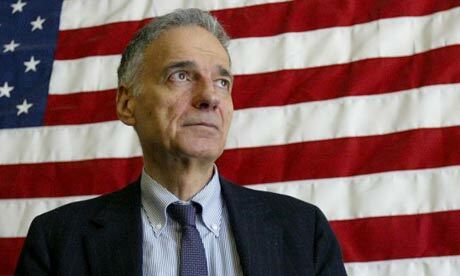 If anyone has earned the authentic recogntion of ptriotism in the true sense, has lived and served by the spirit of what it is to be a patriot, it must surely be Ralph Nader. Mr Nader does not need or require a flag lapal pin to earn that title. Well Ted, I wished I had said those words myself. Great short paragraph that says it all. There is one but though as always. The present Conservatives do not understand patritism to this level. They are the ones who need the lapal pins to remember they are still Canadian. Their allegiance is to money and profits and once in the DNA it is almost impossible to change. I personally think that they are past the DNA, they are now at the Virus level. Ralph Nader is a great American and a great citizen of this planet. Well I have a correction and then shut up. I meant patriotism. Ted and Carlos, I caught a snippet of news on CNN yesterday that focused on the “narrative” of patriotism. It’s devolved to: Republicans = patriots. Democrats = not patriots. Pathetic. Having lived through the post 9/11 paranoia and violations of civil liberties I can confirm that Nader nailed it.,.and Harper ought to be ashamed of himself. Thanks for posting this Susan. As you already pointed out, unfortunately, what we are facing is not nearly as simple as left vs. right. We are witnessing all western governments, regardless of what end of the spectrum they represent, engage in the fear and war-mongering that is described by Mr. Nader, and the advent of the security/police state. Take Barak Obama (ironically a Nobel Peace Prize winner, who has not only endorsed and perpetuated, but intensified George Bush’s policies of war – bombing 7 countries in 6 years), as a case in point. As for Justin Trudeau’s position on this issue, I can only assume that his father, who is responsible for our Charter of Rights and Freedoms, is rolling over in his grave. Andrea your point about Barak Obama intensifying George Bush’s policies is a perfect example of what Pulitzer Prize winning journalist Chris Hedges says is the biggest failure of the small “l” liberals. In a misguided effort to gain votes the liberals have moved so close to the small “c” conservatives (Republicans) that the two parties are indistinguishable. Hedges says this is the real reason that voters have become disengaged–they get the same old policies regardless of how they cast their ballots. I think Chris Hedges is absolutely right. In the US more than in Canada, but the situation here is not much different. The Liberal party is currently where the Conservative party use to be and the NDP in the space previously occupied by the liberals. I think if Jack Layton was still with us he probably would have had a chance to form the government in the coming election. Thomas Mulcair is a good leader and an astute debater but he seems to always be angry and that turns many people off. The liberal party is way to the right and for the same reason as in the US. They could not attract voters and they decidedly move to the right to be able to compete with the extreme right wing Harperists. If the conservatives win the next election, they will make the last push to where the Americans are because that is Harper’s final objective. Canadians so far have taken the bait even though they are only 39%. How many chances to elect ‘fire in the belly’ Ralph to POTUS did USeans waste? Every one. Canadians should take note, lest the world think them just as domeless, doing the same thing over and over while expecting different results. That’s been slowly changing Carlos; as time passes and the odious legislation/evidence of corruption piles up I think that more and more (Canucks) are finding everyone else NOT ANGRY ENOUGH. Anecdotal, but in my (Canuckian) circle the attitudes have certainly changed dramatically since 2011. It bears repeating: the last federal election the only thing that separated the official opposition from the ruling party was about a million and a half popular votes; or a mere fifteen percent of those too ignorant/lazy to register their mandate. “Anger is an energy” – John Lydon. I have high hopes for Canada this year; but I would always settle for a minority gov’t over the horrorshow ‘majority’ Canada has in place right now. GoinFawr I agree with you in terms of Thomas Mulcair and believe me no one is angrier than myself. I was raised in a different culture and although I love the sense of calm and anti-argument typically shown by people born and raised in Canada, I have always said and still do, that it is extreme. Arguing respectfully even when voices get a bit stronger is good to resolve some intractable problems. The problem seems the be the usual. Humans are very bad on moderation. We have us Canucks and then ISIL. Not too many in between, at least as far as I know. I always have high hopes for Canada but unfortunately I am witnessing trends that really bother me. Canada is not the US or Germany, we are unique and if we took advantage of it we would astound the world with possibilities beyond what most people believe, but somehow 39% of people are driving us to a very well known path which is right in front of us in the South and which goes no where other than to half a dozen pockets. I am truly angry that the other 55% of us cannot get in sync and get this darn idiocracy out of there. We have the majority. They are devoid of anything that can be exciting and creative for the future of this great place we live in. I am sick of fear and the permanent sense of austerity, spin and distrust that this present government seems to thrive on. Always enjoyable to read your posts. Great article and intelligent remarks/observations. ….only, to witness a [Harper’s] minority of Canadians head down the same U.S. path, under theological subservience to the almighty Corporate mantel. While the Progressive Party of Canada was highjacked even farther to the right, by the [dung kicking] Reformers, it seems the Liberals slid into the void, entrenched even farther right of center. There is IMHO, absolutely very little difference between Canada’s Liberal and Conservative Partys; As long as Trudeau (listening to his corporate overlords counsel) keeps his mouth shut, he may have a small shot at fooling Canadians…. I too, desire a coalition (politics of mutual agreement/compromise) of the left; however comma, as in America, our Liberal Party has long succumbed to the ‘right’ theology of corporate economics. Young Trudeau, has been accused of being unable/unwilling to express any platform; it’s as if he has been standing in front of the mirror (in Harper’s on-suite) admiring the reflection of power…….adopting every platform that the Americans slowly seem to be dropping (prisons, surveillance, torture, corptocracy) or at least acknowledging their errors. The shame is that Laureen, has not had the lady parts, to call either of them out; But, being Stephen’s second fiance/choice (to Cynthia Williams) in mates, //STRONG SARCASM ALERT// (the latter subsequently attested to Stephens ‘strong sense of loyalty’) she may feel the ground a bit unsteady. Harper has been accused of stating ‘you will not recognize Canada when I’m done with it’ [or words to that effect]; And he was right; up until recently, people like Duffy simply got run over by the Harper bus on inflated judicial charges. Post C-51/creeping fascism, is reminiscent of countries, where people simply disappear. * Please forgive the ramblings of this retired ole Canadian soldier. I so agree with Nader, Bravo for bringing this too light. Is Ralph Nader a Canadian or an American? Perhaps he should be more concerned with what is happening in his own country. Uh, he spent his entire career being concerned with what is happening in his ‘own’ country; so much so he ran for President five times. Fortunately for hosers he has ‘fire in the belly’ to spare. Where the hell have you been, Howie? I guess the Syrians, Iraqis and Libyans would say the same about us. I would anyway. Kathleen, GoinFawr and Carlos: I agree! Nader is correct and I am glad he has articulated it so well. Harper will say and do anything to be king of Canada. He has been recognized as being in contempt of our House of Commons and Parliament. This has not made any difference. He has lied and does not care about it. I have seen him referred to as a sociopath. I think it may be more accurate to call him a psychopath. He has even said that if he does not get another majority he will guit. He does not play well with others. His domocracy consists of everyone who agrees with him. ….. I have to stop now as my anger and blood pressure are rising. …..